What a Show, what a party. What a show. Wow. That was something special. It was so British. Just like an Eccentric British Woman who could decide what to wear; so she threw it all on. It was Directed by David Arnold and was a mash up of Rock and Pop music which can only be described as a whole lot of fun. Ok it didn’t quite top the opening Ceremony but it was heartfelt and Playfully British. The show started with the chimes of big ben followed by Emeli Sande who offered a stunning Banquet of Vocals. I want to Scream, I want to shout. There was a performance by Stomp the phsical Theatre group which took place on a model of the London Eye which was part of the London sky line Olympic Set. Timothy Spall was Winston Churchill with words from the Shakespearce Tempest which was a nice touch, just wished there could have been more like it. I had to laugh when I saw the “Reduce Speed Now” sign. I’m not sure if are constant need for Road works is something to brag about. Lets just be Thankful they didn’t put that sign out when Bolt ran. Our National Anthem Shined. I don’t think I have heard it sung better. The reference to the Only Fools and Horses episode “Hero’s and Villains” was a light and humorous touch which didn’t last long enough. And I liked the line from the British film The Italian Job, if only they had executed it better. Your only suppose to blow the bloody doors off. “Our house in the middle of the street” what a perfect song to set the mood. The Brass Band of the guard Division was a wonderful touch. The dances moved around the stage reenacting street parties, it was like a carnival in a Traffic Jam and I mean in a good way. Although George Michael didn’t play one of his well known songs it didn’t dampen his performance. It was like watching a true star. The apearance of Annie Lennox made me smile but I feel who ever was on sound needed to increase the volume of her voice, as I could barely hear her. What were you trying to do, make us think we knew the song? And have us mouthing along to Sweet Dreams. Ed Sheeran, Nick Mason, Mike Rutherford and Richard Jones performance of a Pink Floyd song was like Marmite. I personally quite liked it. Just try not to compare it to the original. Russell Brand cannot sing but that was half the fun as you didn’t expect him to be able to sing. It was like watching Willy Wonka standing on a hallucinogenic mini bus. His presents then followed by FatBoy Slim in/on a Octopus. Although Russell was clearly lip-syncing the song didn’t try to hide the fact it had been put through auto-tune and merely played on it to create an interesting effect. The Spice Girl performance was always a promise they couldn’t live up to. Scary and Sporty Spice shined. They gave it there all and had the vocals to back it up. Ginger and Baby had fun with it whereas Posh looked like she was constantly posing for the Camera’s. Although Boris Johnson must have enjoyed there performance as he was dancing away. You have got to love Boris. Take That’s performance lit up the stage and they Ruled the World. And it has to be said they were much better without Robbie Williams. The Royal Ballets performance was perfect. The right mix of classical dance brought to life in a modern way. The Ceremony was over three hour long and I could write forever on it, analysis each move and vocal but I think this short over view will suffice. I read in a news forum this “And then we close off with a ‘celebration’ of music, mostly drawn from 60s-90s. Not inspiring and frankly not a representation of this modern nation.” But quite frankly I have to disagree the music from the 60’s and 90’s is as relevant today as it was the day it was made. After all the words from John Lennon’s Imagine is a description of what the modern world should be like. You may say I’m a dreamer but that’s the Ideal world I Imagine. 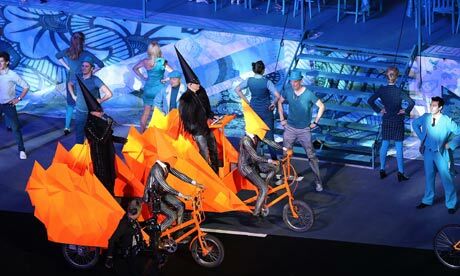 I just want to remind all of you miserable people that the closing ceremony was mend to be a bit of fun and a party. A party for all the Athletes, Volunteers and the world. A party to end all party’s. And we gave the world a very British Party. A little bit Cheese and part fun mixed up by Russell Brand. And for all you in doubt I loved the Giant Octopus, I don’t have a clue why it was used but it was fun. Jessie J may have a voice but it looks like she didn’t have a stylist. Who thought it was a good ideal for her to wear a leotard with one leg and one arm? Although her hair looks great. Now here is a leotard that works. It has two legs and two arms and Mel B from the Spice girls looks amazing. I might even go as far to say the best dress Spice Girl. And there is nothing scary about her curves. She made posh spice look like a twig. Naomi Campbell looks like the Super model she is here. Wow she rocks McQueen. The only other model who even had a chance to shine next to her was Kate Moss. And Kate Moss worked the dress and the screen, to remind us why she is Britains favourite Model. They both worked the Runway like Goddess. Wow. Campbell and Moss look timeless and certainly don’t look there age. On a more eccentric note, I picked up that Pin stripe suits were popular when the Pet Shop Boys performed. The men riding the bikes wore Thick pin stripe suits with orange ties to compliment there orange bike, orange trailer and orange helmet. So here it is, the end of 7 years anticipation. And how it end with a bang.